Critics and fans alike hail Satoko Fujii as one of the most original voices in jazz today. She’s “a virtuoso piano improviser, an original composer and a band-leader who gets the best collaborators to deliver," says John Fordham in The Guardian. In concert and on approximately 80 albums as a leader or co-leader, the Japanese native (now based in Berlin) synthesizes jazz, contemporary classical, avant-rock and Japanese folk music into an innovative music instantly recognizable as hers alone. Fujii tours regularly appearing at festivals and clubs worldwide. In this completely improvised solo recital, pianist/composer Satoko Fujii pays tribute to her mentor Paul Bley with whom she studied at New England Conservatory. “I was able to find my musical voice because of Paul Bley. He always encouraged me to express my music, and to sound like myself, not like others. It was a real ‘revolution’ in my life. This concert is one of many special events planned in Europe, North America, and Japan to mark the 20th year of Fujii’s label Libra Records. Critics and fans alike hail pianist and composer SATOKO FUJII as one of the most original voices in jazz today. A truly global artist, she splits her time between Berlin and Japan and tours internationally leading several ensembles. Just as her career spans international borders, her music spans many genres, blending jazz, contemporary classical music, rock, and traditional Japanese music into an innovative synthesis instantly recognizable as hers alone.Her wide-ranging compositions can incorporate the simple melodies of folk song, the harmonic sophistication of jazz, the rhythmic power of rock, and the extended forms of symphonic composers. Although Fujii’s compositions are full of sudden shifts in direction and mood, the extremes are always part of a greater conceptual whole. The 2015 el Intrus International Critics Poll recognized her as one of the composers of the year. As an improviser, Fujii is equally wide-ranging and virtuosic. In her solos, explosive free jazz energy mingles with delicate melodicism and a broad palette of timbre and textures. 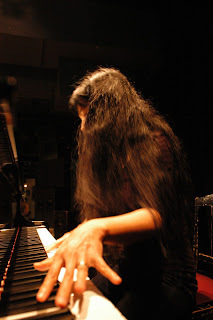 Born on October 9, 1958 in Tokyo, Japan, Fujii began playing piano at four and received classical training until twenty, when she turned to jazz. From 1985–87, she studied at Boston's Berklee College of Music, where her teachers included Herb Pomeroy and Bill Pierce. She returned to Japan for six years before returning to the US to study at the New England Conservatory in Boston, where her teachers included George Russell, Cecil McBee, and Paul Bley, who appeared on her debut CD Something About Water (Libra, 1996).